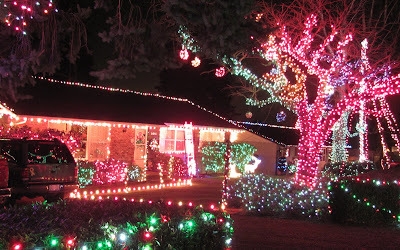 I blogged about a Bellingham house on December 31 2006. Glowing again this year in LED splendor. I captured just a slightly different perspective. Maybe the house isn't that great, but it's noticeable at least. Depends on your tastes. See my blog posts on Christmas and scroll past house to rest of posts about Christmas subject if you wish, or more likely if you got the time. It's rush, rush time for some folks at least. I haven't rushed to my home town where my two sisters reside just to do the one day called Christmas. How much time do we get off work? Still, my sisters inadvertently gave the gift of their polyphonic voices on my answering machine. Both saying "Hello Robert" from phone extensions in different parts of our childhood home, it sounds like a friendly choir.